As a family business, our clients’ satisfaction is the most important thing to us. We feel immensely proud when they experience the pleasure of our bespoke kitchens. We wanted to let you know how pleased we are with our new kitchen. It has fulfilled and exceeded all our expectations and become the heart of the home. It is the place where everybody congregates when they come to the house. We were impressed right from the start when we first met James. He took great care to listen to our requirements and ensure that the design was exactly what we hoped for. His thoughtful guidance has ensured that it works functionally and aesthetically. One of the greatest advantages of having a bespoke kitchen is that there is no wasted space, and the appearance is well balanced and harmonious. The quality of both the units and the fitting was first class. Nothing seemed to be too much trouble, and the fitter went to great lengths to achieve the best possible finish. We had three designs and quotations from different companies when choosing the kitchen, the other two using standard factory made units. The cost of your was very similar, but we felt the design and quality was going to be far superior, and we were not disappointed. Thank you for our kitchen. We found our meetings with you very businesslike. Our initial idea of following the line of the wall in and out of the alcoves, did not look satisfactory, and your plan of ignoring the alcoves and keeping to a strict “L” shape for the units looks much better. Each individual unit looked a nice piece of furniture when we saw it before installation, and they fit together so well. We like the mechanical storage areas, the pull-out Larder Unit, and the corner unit which have proved to be very good features. I would like to express my appreciation for the excellent job you did in fitting my new kitchen. James was very helpful in helping me to decide what might work best, and in suggesting new ways of improving storage and access space. Your fitter and his Team were excellent and did their best to minimise disruption. They could not have been more courteous or helpful. I would be grateful if you could contact me sometime to discuss the fitting of a new Study. During the widespread preliminary research, only James actually listened open-minded to an explanation of our particular needs and aspirations. Using his insight and experience, and without further to-ing and fro-ing, he produced an attractive design needing only minimal fine-tuning. All those who then played their parts in the fitting-out sequence proved efficient and amiable, contributing greatly to a stress-free and fulfilling process. We are delighted with our kitchen, which is just what we were looking for. Now that we are able to enjoy our new kitchen we want to thank you for all your time, help and advice that you have given from our first meeting through to the completion of the project. Your design of the overall layout, together with the intricate details of cupboard, drawer and accessory options, have combined to give a light and practical kitchen. The fitters were reliable and very particular in the quality of the job, taking time to ensure a neat and tidy finish. All this together gives another delightful achievement for the Bath Kitchen Company and we wish you every success for the future. Now that we have had time to enjoy the new kitchen, I would like to take this opportunity to write to you, and let you know how happy we are with the outcome. We would congratulate you on creating a layout that improves the overall efficiency of the kitchen within the planning constraints of the usual shape of the space, and the existing positions of the Aga and the (Built-In) Larder. In addition, providing increased and more efficient storage space. We would also like to complement both your general building subcontractor, and the stone (granite worktop) subcontractor. Both of them undertook their work in a very professional and considerate manner. We are very happy with the quality of their workmanship and their attention to detail. Whilst we never met the cabinet makers, we are very happy with the end product. We would have no hesitation in recommending your Company to prospective Clients, and we would be happy for you to use our kitchen as an example of your work, should you wish. It was a pleasure dealing with you, and we wish you every success in the future. James, David and The Team at BKC have been brilliant. From our initial discussions with James more than a year ago, and way before our kitchen extension build even began, to sorting out the finishing touches in the kitchen, and now using the new room to our home, we couldn’t have been more pleased. James gave lots of good ideas about layout, materials and the usage of the kitchen as the usable space we needed to create, which influenced the building structure as well as the design of the finished kitchen itself. The Team did not object to our evolving ideas, and helped to refine them. The Fitting Team were experienced, efficient, helpful, and just excellent, getting the job done in less time than was planned. And the final result is exactly what this Doctor ordered! With the perfect balance between practicality, design and aesthetics. We love it, and are certainly using our new space as more than simply a kitchen. Thank you! Angela and I would like to convey our thanks for delivery of our excellent new kitchen, which Bath Kitchen Company recently designed, built and installed for us. The overall design, the hardware and the workmanship were all top quality and we are delighted with the finished product. We were particularly impressed with the project management, which meant we had little disruption during the build work, with all aspects of the new kitchen delivered on time and looking great. We would have no hesitation in recommending Bath Kitchen Company to other prospective customers. We are thrilled with our kitchen. I hope that these comments convey our appreciation for your wonderful work. As you may know, we spoke to many kitchen designers, including Harvey Jones and Roundhouse who all produced similar layouts. James came up with a uniquely inspiring plan that beautifully integrated our kitchen within the large open space we created, (from three rooms, a corridor and a mini courtyard). You also worked hard to understand our lifestyle, to ensure that the stunning design withstood the daily demands of a busy family with 3 young boys. You guided us through many iterations, patiently sharing your experience and wisdom. Our kitchen has become the heart of our refurbished home. It looks fantastic because the units were purpose built for the space. And it’s wonderfully efficient. Everything we need is to hand. Finally, during our move we found the invoice for the kitchen we installed in our last house, twelve years ago. We were amazed to realise that we spent the same amount of our delightful new kitchen – astonishing value for money. Bath Kitchen Company provided an excellent service, and we were reassured that we had such a good company locally, as choosing a new kitchen was a difficult process. We would definitely recommend them to anyone who wants a new kitchen. Lynne and I are delighted with the design and how it has turned out in practice. We think that the kitchen looks absolutely right in the context of the large open space which we now have, and I am sure that we shall enjoy it for many years to come. We are absolutely delighted with our new kitchen, which never fails to impress those who visit our house. 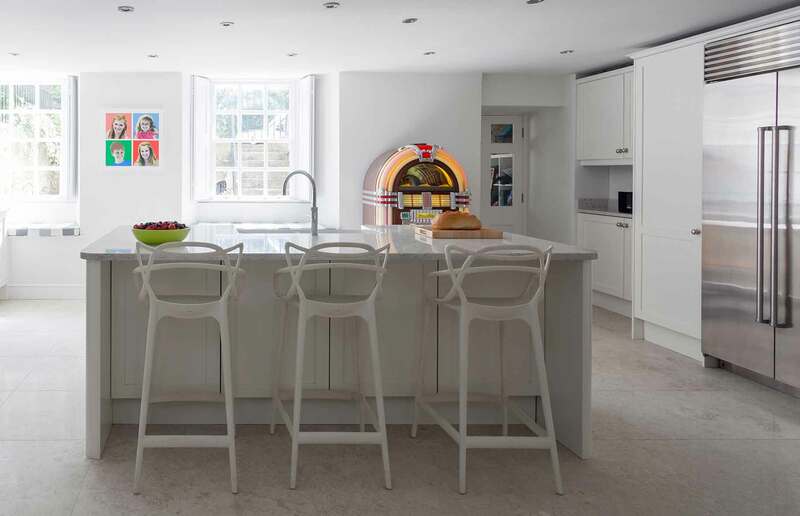 You clearly understood the brief for a timeless kitchen, with emphasis on restraint from the outset and has delivered, with the help of a keen, inventive and responsive Kitchen Fitter, a beautiful and functional kitchen in a tightly constrained space. It is difficult to overstate just how tight the tolerances were in our house, and how relieved we were that we had chosen the right people for such a challenging job. Bath Kitchen Company’s commitment to Client satisfaction was put to the test when we changed the knob specification to a handle at the last minute, news which you took without apparently flinching. Even when the under-counter lighting specification was changed at the very end of the installation period, this was taken on willingly and with a determination to get everything just right for us. We would not hesitate to recommend Bath Kitchen Company to anyone in need of a new kitchen, and have already done so. Thank you very much. Now that our kitchen is well and truly completed, I would like to say how delighted we are with it. Firstly, we think that the design is quite ingenious, in that every available square inch of space is used to maximum effect. Thus we have much more storage space than before, and – something my wife has dreamed of! – a very large refrigerator. The two shelves which swing out are most cleverly engineered and give us maximum storage with optimum access. Secondly, we are most impressed with the quality both of the cupboards and of the appliances: cooker, dishwasher, freezer and so forth. Everything is clearly built to last! Finally, may we compliment you on the installation. The work was carried out meticulously with the result that the quality of the finish is very high. One example among many is the boxing-in work around the boiler and pipes which has enhanced the appearance of the kitchen considerably. We would recommend Bath Kitchen Com­pany without hesitation to any one as completely trustworthy, reliable in doing what is promised. Having just had the kitchen in our 18th century property fitted out by your Company, we would like to record our admiration and appreciation. We are ­delighted with the outcome, and feel that we were fortunate in finding you. ­James, in offering us the initial guidance over colour and style, was invaluable: without him we we might not have had the uniquely satisfying blend of old and new that we do have. His advice on appliances too was wise and well-informed: we had previously had a quotation from a reputable national company for the same equipment, so we know that you were better value. James was also remarkably calm and unendingly patient when we veered from one choice to another. Phrases such as, “That will be fine, there is still time to change the specifications for the cabinets”, passed his lips without apparent pain. Many kitchen fitters would have been thrown by the fact that in our property no two walls are at the expected angles, the roof has various levels and the owners of the property are very demanding. That did not worry your colleagues – they had the imagination to see what was possible when there were no obvious solutions, and proved to be more perfectionist than we were. They fitted a heated stone floor, (which initially we had not even envisaged) superbly, and we would now never want to be without it. They suggested ways of improving the lighting that we had considered, they did the plumbing, fitted in new appliances and installed a range of cupboards and working surfaces. The expertise in joinery of your main fitter was evident, and his attitude to doing things thoroughly was so apparent that we have total confidence in what he created. We have finally got round to writing to thank you for our new kitchen, six months after completion in August 2011. We are delighted with our new and completely redesigned kitchen. In the initial stages James had the vision to come up with an innovative design that both looks stunning and provides us with more usable space and storage. James design was the only one of the four quotes we obtained which completely redesigned the kitchen incorporating our needs rather than simply repeating the previous layout. The supervision and project management of the whole fitting was excellent. The fitting team were a pleasure to have around, and were always efficient, tidy and cheerful. We were so confident of James by the fitting stage that we happily went off on two weeks family holiday, and came home to a nearly completed kitchen. The attention to detail and response to our queries throughout was excellent. We even had some minor changes incorporated into the fitting at our request, without any extra charge. After care and support has also been excellent. We are happy to recommend Bath Kitchen Company to anyone looking for an innovative and first class design and fitting service. We have just completed a large new building, in the countryside near Frome, and feel that one of the most successful aspects. 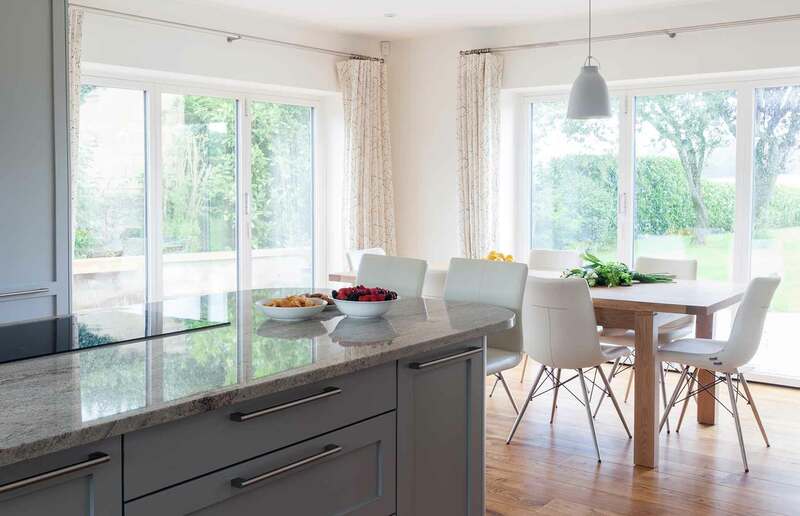 We have just completed a large new building, in the countryside near Frome, and feel that one of the most successful aspects has been the superb kitchen you designed and fitted for us. From the initial contact with James, we have been impressed with the friendly, professional approach and the support and guidance given. Nothing was too much trouble and all questions and minor queries were always treated with respect and gave us confidence to make decisions when there were so many things to consider at the same time, with all the building work being undertaken. The actual fitting of the high quality units and appliances was completed in a very pleasant, efficient and reliable trades person. Now we have moved into the house, we can start to fully appreciate the ease of use, the ergonomic layout, and the sheer “wow” factor of the kitchen. It is the heart of our home and is enjoyed by all the visitors who call to see our new house, all of whom are very impressed. Thank you for everything you have done to transform our dark, dingy, cold, miserable basement into the most incredible. Thank you for everything you have done to transform our dark, dingy, cold, miserable basement into the most incredible, contemporary yet friendly kitchen space. We all absolutely love it and friends cannot believe it is the same room. From our first meeting last summer, you have been as enthusiastic and committed to this project as we have and it has been a pleasure to work with you. David has also been very patient and helpful on many occasions at the end of the phone! You assisted us with the design, providing us with options to choose from within the budget. You came back with different suggestions and possibilities. You have shown incredible patience, thoughtfulness and professionalism throughout the entire process. The actual fitting of the kitchen, when we were finally ready, was done efficiently. Your attention to detail has been much appreciated as well as the genuine interest and care you have shown throughout and afterwards. We would not hesitate to recommend you, and have done so already. Just a quick e-mail to let you know how pleased we are with our new kitchen, and with Bath Kitchen Company! We are also really pleased with the paint finish in the units – it is very practical, easy to wipe clean and, so far, even tolerating the puppy’s claws and paws! Despite the snow and Christmas holidays, the whole project ran very smoothly too. We would certainly, (and already have), recommend you to anyone interested in a lovely new kitchen. I have now lived ­in my house for a year and it is finally complete. The reality is that without your help I doubt very much that it would have been achieved. The kitchen is the heart of the home, and the heart of my home is now exceptional. I have now lived in my house for a year and it is finally complete. The reality is that without your help I doubt very much that it would have been achieved. The kitchen is the heart of the home, and the heart of my home is now exceptional. I can only thank James for his guidance through the various stages of the design. It was my first house project and the potential for many errors due to my exuberance were legion, but I was expertly led through the minefield. James took time to really hear what I wanted, and helped me to to achieve not only a well functioning kitchen, but also an aesthetically stunning space. I also want to thank you for taking the time to source the bits of flair that I so desperately wanted, from the leather handles, to the red cooker. You took the time to ensure that it was absolutely my kitchen. I am aware that I asked a lot from you, and you more than delivered. I was always left with the feeling that nothing was too much trouble. Everything I asked for was given consideration, even when, (to be frank), I was just being slightly ridiculous. In talking to other people about their kitchen experiences, I’ve realised how easy my life was made by using Bath Kitchen Company. I’m sure there were headaches and disasters, but I knew nothing about them. All my funny ideas were met with a workable solution, and the result is that I could not be happier with my kitchen. I’m afraid I’m rather smug about the entire thing. It’s been a few months since our kitchen was finished, and we are continuing to get as much pleasure out of it, as we did when it was first installed. I want to thank you for making the whole process so easy. As you know, I had no idea how to go about choosing a kitchen – and no patience to look around endless kitchen showrooms. My remit was for a timeless and well built kitchen, which looked like it was part of our Victorian house, but at the same time you had to come up with a design that did not look – well, too much like a kitchen. You rose to the challenge superbly, and designed us a kitchen which was so exactly right, not only for the room, but also for our lifestyle. 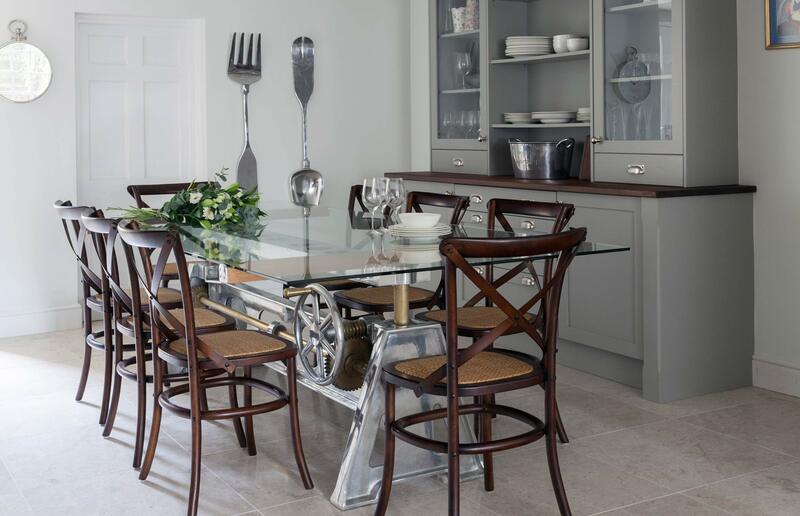 I really am truly delighted with my kitchen, – and what I want to try and stress is that you took away the hassle factor and sorted me out with exactly what I (had not realised) I wanted, without me having to leave my (old) kitchen table. I’m still enjoying the WOW factor when friends walk into our new kitchen, and it has proved a perfect setting for both adult dinner parties and children’s pizza parties. I am as much at home in it reading a book, as I am cooking a family meal. I am really pleased with the quality of the kitchen, and was very impressed by your kitchen fitter. More importantly, everything was finished exactly when you said it would be. Thank you again for making such a daunting process so easy, and for designing us such a stunning kitchen. Many thanks for everything…..we absolutely love our new kitchen! The transformation from “gothic shed garden” to “beautiful, spacious and timeless” has been incredible. The level of customer service we have received from the Bath Kitchen Company, from our first meeting with James, to completion of the project has been truly exceptional. Nothing has been too much trouble, and we felt that we could call the office at any point to discuss the work – or even just to receive reassurance that everything was progressing to plan. James was inspirational with his clever design ideas, ensuring that we made the most of the space we have – which has worked brilliantly. We are so glad that we trusted and stuck with James’ choice of colour, (not one we would have chosen, but we do love it! ), and which looks gorgeous: how on earth could we have gone with a couple of ideas we had in mind…?!!! The kitchen is everything we could have wished for – stylish, spacious, has lots of workspace, is well lit and just fabulous. It now also has a real country cottage feel to it, and it is a pleasure to walk into the room every morning. Family and friends who have visited us recently have also been bowled over by our fabulous new kitchen – with everyone asking who on earth did this work for us! We are absolutely delighted with our beautiful new kitchen. It is smart, clean, elegant and great to work in. I am no longer alone in the kitchen as everyone migrates to this room. The whole team were very professional and made the disruption tolerable, and the end result was well worth it. Many thanks to all involved. As I have said before, we are thrilled with our new kitchen. It turned out better than I was expecting and is everything I was hoping for. Your service was superb, your recommended builders were excellent, and a pleasure to have in the house, (they even dog-sat)! The timescale that you promised was met, and I cannot find fault with any aspect of how you handled things. Just a short note to thank you both for the efficient and friendly manner in which you fitted our kitchen. We were both delighted with the result, which has helped to transform our house. Now that our new kitchen is well bedded-in, I thought I should drop you a short note of thanks. The design stage seemed to us to be both expert and sensitive to our requirements. The work itself was bound to be a complicated operation, including installation of a completely fresh set of “white goods”, plus a new boiler system and the opening up of a new back door. Thank you James for designing us a beautiful kitchen. It is simple, very elegant and it works. It does everything which we asked for. The whole project was well planned, and well executed and almost finished on time! Your fitters, builder and electrician were all very skilled, talented and pleasant to have around. Whilst we are very glad the kitchen is now finished, it was worth it. Now that our new kitchen has had a chance to bed in, I felt that I just had to write to let you know how delighted we are with it. 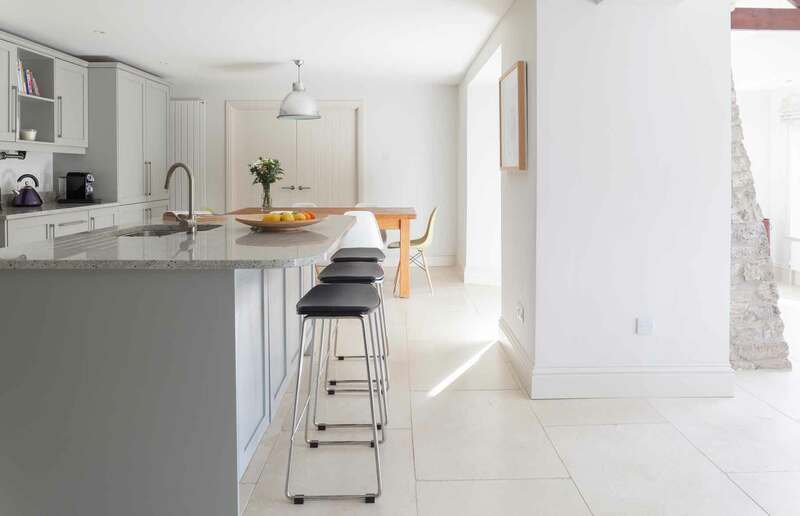 With the layout of the kitchen and dining areas being totally reversed, it was a really complex undertaking, but the project progressed seamlessly throughout. The new design has proved a real winner; the units and appliances are all that we could have wished for; and the timekeeping and skills of your fitters and electricians have been exemplary throughout. My initial contact with the Bath Kitchen Company was through Colin Fraying (Managing Director of F. W. Hawker and Sons from whom I have much top quality joinery and other work over the years on my grade 2 listed cottage of 1830). Naturally I wanted a similar high standard of workmanship and attention to detail when it came to a new kitchen and I was not disappointed. From our very first meeting I knew that you were the sort of person I could work with. For a start you took the time to find out, in considerable depth, my likes and dislikes and also quite clearly understood the key elements of the brief (which was more than can be said for a certain nationally known company producing kitchens in the same quality range). Basically, you designed the kitchen round me and my life style, rather than expecting me to fit in with some preconceived idea of “correct style”. I was most impressed by your attention to detail and the extremely patient way in which you dealt with my questions and amendments, through no less than 5 sets of plans until we agreed the final design. I also must draw attention to the way you happily accepted the challenge of obtaining the hand painted tiles from the Palestinian Tile Company in Jerusalem, after I fell in love with them having found them on the web. The kitchen construction is to the highest standards, from the dovetail joints in the drawers and the beautifully polished green granite work surfaces. Also the appliances that you recommended are a joy to use. I wanted a “cooks kitchen” and that is what I got, but with style, balance and harmony as well! In this letter of appreciation I want to give a special “thank you” to all the craftsmen who worked on the project, from Hawker’s joinery team, Lloyd and Blackmore electricians, the granite stone masons and last but by no means least your kitchen fitter. In my experience having over the years carried out much restoration work in the cottage, selecting good workmen is an essential component in the successful completion of a project with the minimum of hassle. So to sum up thank you for giving me my dream kitchen, it’s a joy and delight to use and my various dinner party guests have, without fail, been fulsome in praise both for the design and the overall quality of the finish. I would confidently recommend your company to any of my friends and colleagues. We are writing to say how very pleased we are with the kitchen you designed for us, helped by James and his computer graphics. The clean, uncluttered lines look very well in our relatively modern house and the finish of both the cabinet work and the fittings is excellent. Your fitter did a good job in installing it, despite the various alarms and excursions by the suppliers, inevitable on a job as complicated as a kitchen. You were always on hand to resolve any problems if they arose, and did so with great courtesy and promptness. We are delighted with the outcome and would recommend your company to anyone who wanted a kitchen hand built and unique for their situation. Feel free to invite any future clients to contact us if they would like to know more. Firstly, the process of designing the kitchen was an enjoyable and creative time for us as we were able to share our ideas and you were able to realise them in the form of well-executed plans. The quality of the materials and build is second to none, the units and accessories are of a high specification and the way they have been constructed is exceptional. The kitchen functions extremely well to meet our needs and we are looking forward to years of enjoyment from it. Finally, we’d like to say that we appreciate the service you provide; you clearly enjoy your work! We do not hesitate to wholeheartedly recommend your services. Now that the fitting of my new kitchen is complete I am writing to say how pleased I am with the finished work and to thank you personally for your attention to detail which has produced such a delightful room. I am sure my late husband, who as you know was an Architect, would have shared my appreciation. We had some problems, which are inevitable with an old building, but I must say both you, James and the Builder coped with every thing remarkably well! Please do not hesitate to ask me if you would like me to speak to potential customers and if it helps, I am happy for people to look at my new kitchen. (Give me notice and I’ll even tidy up first)! You re-modelled our kitchen 13 years ago and it has been an ongoing pleasure and success over the years. When we asked you to renew and extend our facilities all our doubts were quickly allayed and your proposals were soon approved. Now all the work, ceiling, down lighters, new doors matching the existing, replacement of cooker, tiles , worktops, extraction unit and making good, has all come together, as promised, to our complete satisfaction. We wanted to provide you with an update following the completion of our kitchen in 2006. The last six months have proved to be the justification for the upheaval that is Inevitable when replacing one’s kitchen. Your role in the kitchen “makeover” smoothed the way and has been a key element in its successful end-result. We consulted with a number of kitchen providers around a year ago to find one that would meet our specific requirements. We chose you over the others for two main reasons, the first being that you listened to what we wanted and were prepared to make repeated amendments to plans until the optimum was reached and the second; that you provided a complete package; from sourcing appliances to building be-spoke cabinets. Price is always a consideration and indeed you offered good value for money, but it was more important to us that the solution we chose was one that was tailored to our needs. The implementation of the kitchen plans progressed largely to plan and on those occasions where arrangements digressed, you kept us fully informed which was very reassuring. We were particularly satisfied with the fitter who worked around the clock and had a fine eye for attention to detail. The final result is, as we say, a success. We are now “living the dream”. The kitchen plays a central part in our home and it was essential to us to get it right. We are happy this has indeed been achieved. Thank you both for your efforts to that end. Thank you so much for the wonderful kitchen that you designed for us. It has proved to be the most practical kitchen to work in, and more beautiful than we dared to hope. The Fitters were swift and professional, and James vision from start to finish was admirable. I thought we had set quite a challenge with the space we were converting from a Utility Room to a Kitchen., but James was quietly confident throughout and his assurance helped tremendously. The units are of the highest quality inside and out, and we especially like the depth of the cupboards to store pans and plates in. I have sent some snap shots from my camera phone, but please feel you can come over to take photos at another opportunity – because our kitchen is divine!! Just a short note to say how pleased we are with our new kitchen and utility room, and to thank you for the way in which the whole project was handled. James spent time with us submitting several plans until we arrived at the one that suited us, and he was always on hand if we had any queries, while making himself available to discuss details with the other workmen involved, ie., electricians, plumbers etc, therefore ensuring that the project ran smoothly. ­ James, in offering us the initial guidance over colour and style, was invaluable: without him we we might not have had the uniquely satisfying blend of old and new that we do have. His advice on appliances too was wise and well-informed: we had previously had a quotation from a reputable national company for the same equipment, so we know that you were better value. James was also remarkably calm and unendingly patient when we veered from one choice to another. Phrases such as, “That will be fine, there is still time to change the specifications for the cabinets”, passed his lips without apparent pain. When your Company said that something would be done as we wanted, you meant it, so we relaxed during the weeks that your colleagues were with us. We would recommend Bath Kitchen Company without hesitation to any one as completely trustworthy, reliable in doing what is promised and guaranteeing a satisfying final outcome. Now that we have had the opportunity to live with our new kitchen for a while, we are writing to say how delighted we are with it. This stems not only from the high quality of the units but also from the practicality of your design. The time you spent working out the fine detail and making adjustments was very worthwhile in producing a kitchen that meets our personal requirements. We were also very impressed with your great attention to customer care. Everything happened according to the agreed timetable and the speed of your trouble-shooting when the electrical suppliers sent a faulty hob was much appreciated. 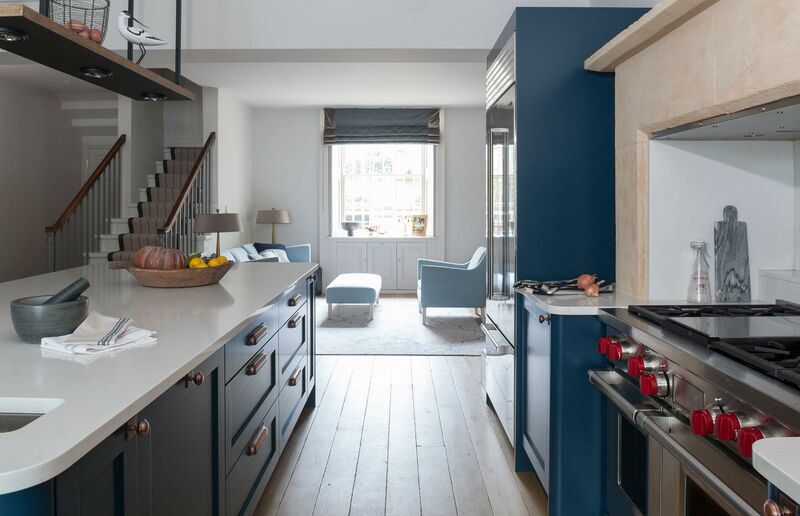 We felt our initial brief was a tricky one – a kitchen which fitted in with the Victorian period feel of our home but also allowed us to put in very modern appliances and fittings without them feeling out of place. We also had a strict budget, which was tight for the quality of kitchen that we wanted. David and James are excellent listeners and were very quick to understand our needs and preferences. Their initial design was 95% there, both in terms of styling and budget. They proposed the use of innovative materials, techniques and accessories, which have ensured that the finished kitchen is just that bit different and entirely practical.Planning and fitting the kitchen was a major project and an emotional one, as this room is at the heart of our home. David was always sympathetic and quick to offer help where possible, as we battled with builders and surveyors through the ever increasing list of pre-work which set back the kitchen fitting several times. When the project finally came under David’s control, we were impressed by his eye for detail and the speed with which any problems arising were rectified. Their chosen fitter cared about build quality and finishing, which made the whole process much less stressful.We now have a kitchen that we are truly proud of – it is stylish, beautifully built and very usable, with more than enough storage space (something we never expected to have!). It also came in on budget and without compromise.